Established in 1941 by Teddy Holmes, the Chappell Recorded Music Library has numerous well known television and radio themes to its credit. It made its name in the 1940s and ’50s with a catalogue of compositions by such light music legends as Robert Farnon, Charles Williams and Sidney Torch. The focus in this instance, however, is very much on the Chappell Library as it was in the 1970s when a new generation of composers were on-board whose outlook was resolutely modern. Accordingly, the music is of the funky, jazzy dramatic variety – in fact, much of it sounds like it belongs in a ’70s spy movie or cop show. 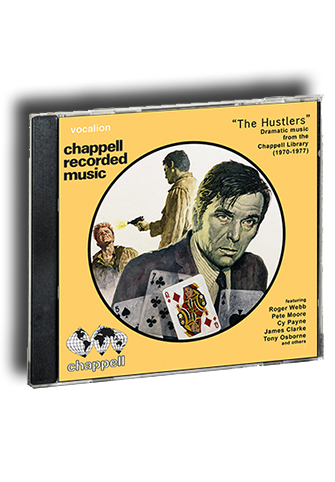 Chappell’s leading composers are featured – Roger Webb, Pete Moore, James Clarke, Tony Osborne, Cy Payne – alongside two superb French composers, Jack Arel and Pierre Dutour, both of whom wrote extensively for Chappell France’s Dance and Mood Music series of library albums. Exciting, jazz-tinged big band and orchestral music is served up here, all of it performed by Britain’s leading session musicians and most of it recorded by John Timperley in Chappell’s famous studio located at 52 Maddox Street in the heart of London’s fashionable Mayfair district. Includes an 8-page booklet detailing the history of the Chappell Library as well as biographical information and the stories behind the music.